Fine chocolate. 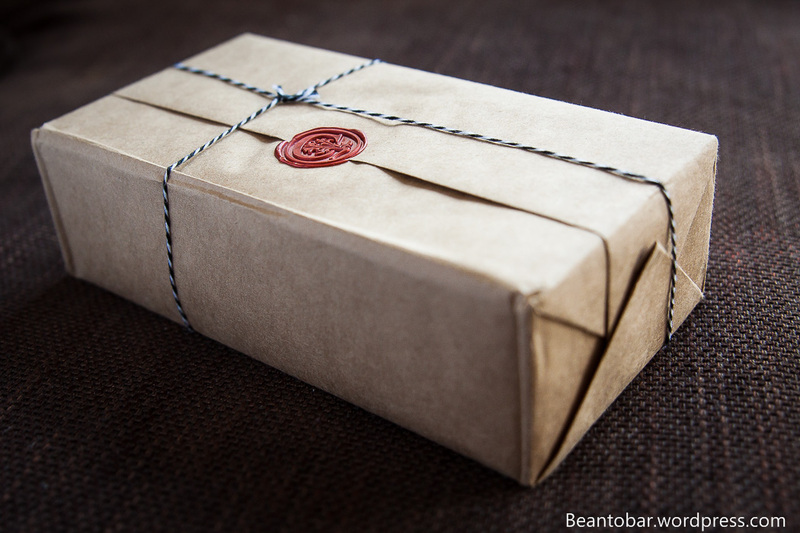 When you surf the net, the number of bean-to-bar chocolate makers grows steadily. Yet it is still pretty difficult to get the good stuff when you crave for it. You can’t exactly get it in you supermarket behind the corner. When you are lucky, you live near one of these wonderful little companies, but if not, you’ll have to have the spirit of a hunter. It takes a while to track down stores who stock these fine chocolates. Personally I love browsing around, hopping into shops whenever I visit cities abroad, hoping to catch a rich deposit of bean-to-bar products. But the chances are few to get the bars you actually would like. Or let a shop owner guide you to a bar you haven’t heard of before and discover something special. The internet is your second source. There are some specialized sites out there, where you can buy chocolate bars, but somehow knowing what you’ll get kinda takes the surprise out of the entire thing. You get what you want, but it feels a little clinical. It expects you to know a thing about the bars, so you make the decisions. Option three is also an internet source, but a different one. 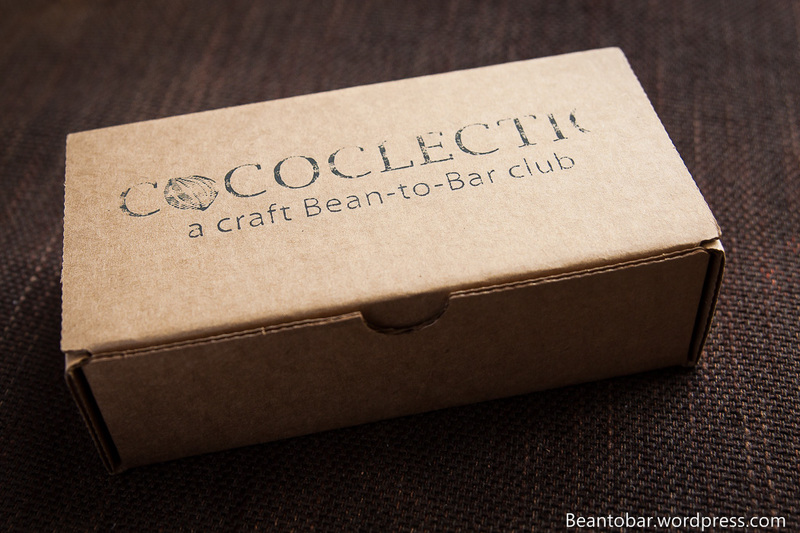 A subscription to a bean-to-bar club. Now here is a great idea. You get the element of surprise and it is delivered right at your doorstep! You let the world come to you. Cococlectic.com is such a club. When you visit the site, you’ll notice the owner sure knows how things are done. You get a wonderful selection of subscriptions, perfectly matched to your rate of chocolate consumption. From a single delivery Gift Box over to subscriptions that are renewed monthly, very 3 months or every 6 months – with prices ranging from $34 to $189 – Off course, how longer you subscribe, the better the deal is. Now what do you get? 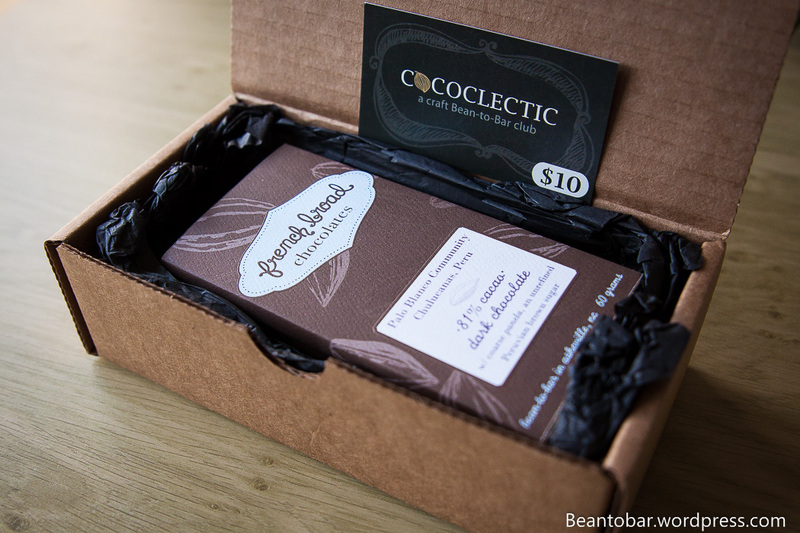 4 bars selected from the vivid American Bean-To-Bar scene, carefully selected by Doreen Leong. Doreen usually only ships within the USA, but for my blog she made an exception, just so I could experience how she goes along – she sent me the March edition of her subscription. A gorgeous rectangular box, wrapped in nice cardboard paper, neatly held together and closed with an actual wax seal. First thing that went through my mind was how special this little box seems. Much like a valuable present, not just like a generic mail order. Inside the wrapper, a sturdy cardboard box, proudly stamped with the Cococletic.com logo. Once you open up the box, the amazement keeps going! Inside, the box is lined with a thick padding, protecting the bars inside. the will certainly guard the bars from being smashed around during transport. Once more this adds to the feel of luxury. In the box you’ll find, a reduction coupon (nice gesture), an extensive text about the chocolate producer selected this month, including back-ground and descriptions of the origins and tasting notes of the bars included. And then off course the 4 bars from the month’s selection. 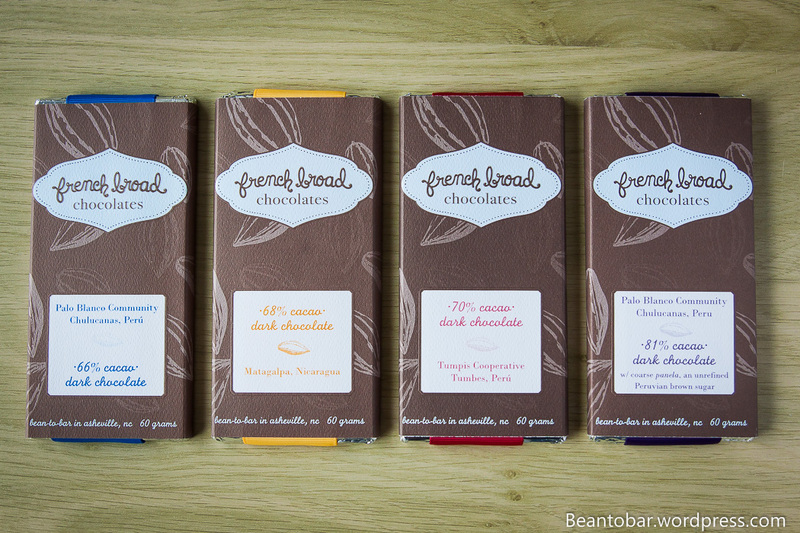 March was the month of French Broad Chocolates, including their 66% Palo Blanco community Peru – 68% Nicaragua – 70% Tumpes Peru – 81% Palo Blanco Peru bars. 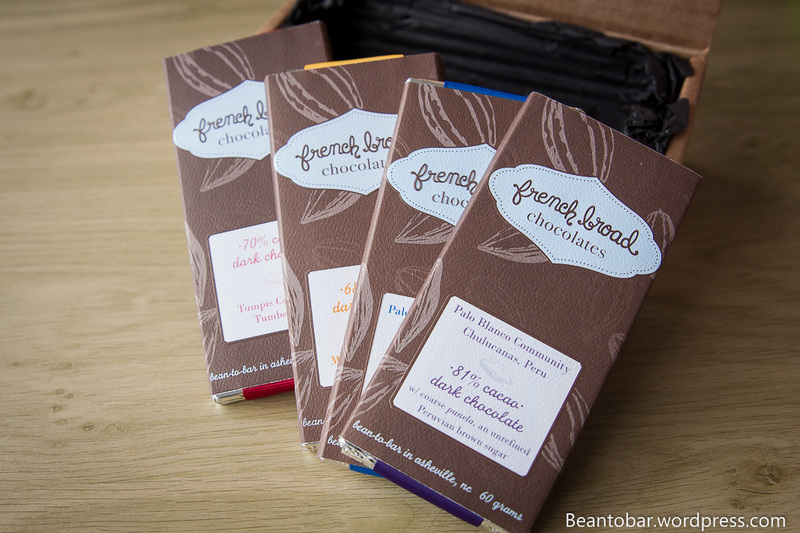 A great selection over the high percentage cacao bars of French Broad Chocolate. I have no experiences with French Broad so far, thus this make perfect sense to me as a selection. I’m really looking forward to try these bars, having great expectations about them. In the weeks to come they’ll be featured in separate reviews. So in brief, what do i think about these subscriptions? They are the perfect way to get introduced to the wonderful word of bean-to-bar chocolate, especially if you want to be guided and surprised by the choices of people who know their chocolate. 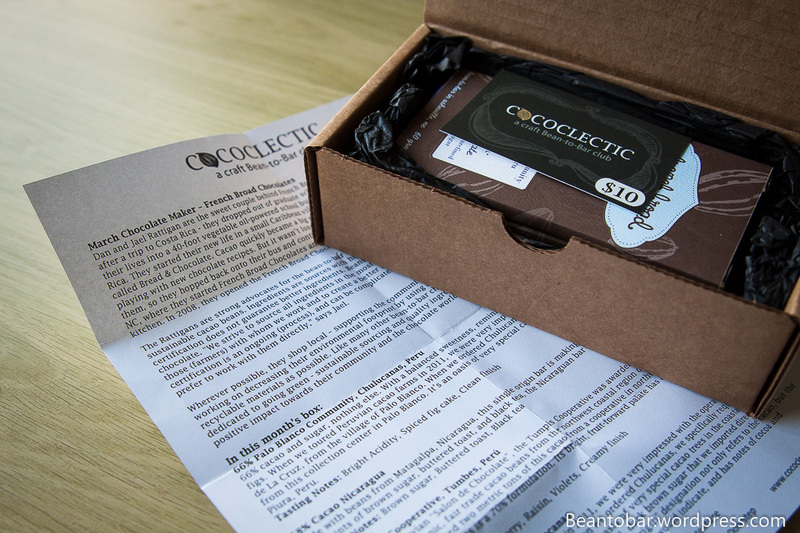 Cococlectic.com has a great way of making this experience special, from packaging to the added extra information about the products and the actual selection itself. The fact that you don’t have to subscribe for a long time and you can cancel at any time if you wish (which I doubt you’ll do when you are a chocolate lover), make this a very appealing offer. The price is very fair compared to the quality bars you get and the services delivered. In my book, this means highly recommended! The only thing I would remark, is the fact that Cococlectic.com only ships within the States, which leaves chocolate lovers from Europe like me out of the picture, while the US artisan scene is actually one of the most exciting around. :OOO awesome!! Do you think she’d make an exception for me too? ?